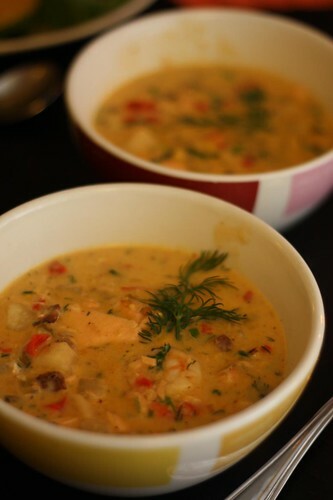 I've been wanting to make a seafood chowder ever since we had a really good one on our trip to Portland last summer. Apparently I'm not very good at putting my wants into action since it has taken me nine full months to make this happen. Today, however, was the perfect storm of leftovers that would make this possible. 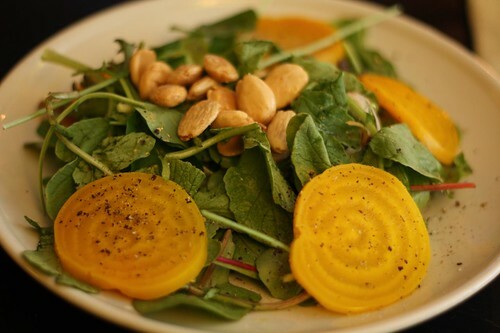 I started by making this salad which used up the remaining mixed greens, radish tops, golden beets, and marcona almonds along with some lemon, olive oil, salt, and pepper. I don't like to brag but I'm pretty awesome at making soup. The rest of my cooking, in my opinion, I can take or leave. My soup making skills, on the other hand, are top notch. I'm not afraid to admit. I used to work in a restaurant where I was required to come up with four soups a day (made primarily out of leftovers) in five gallon batches. Perhaps, if I follow Malcolm Gladwell's 10,000 hour rule this would make sense that soup making is my specialty. I estimate that in a year and a half I made approximately 469 different varieties of soup, 2,346 gallons in total. According to my calculations that's only about 1,407 hours but I guess that was enough for me to get pretty good at soup-making. For tonight's soup I cooked some onion, red pepper, and celery in a little butter. I also threw in some leftover tasso from the other night. After that cooked for a bit I tossed in some celeriac, potato, and a bay leaf. After the vegetables were tender I put in a little seafood stock from the pantry and thickened it up with a small amount of roux. I then added a small piece of cooked salmon and some shrimp from the freezer. At the end I added some chopped scallion, dill, and parsley. The result was pretty good. A little spicy from the tasso but, again, a top 5 soup in my humble opinion. Speaking of humble: more beer brewed by monks! I picked this one up this afternoon on a visit to a local wine and beer shop. All you need to do for me to buy your beer is put any number of works on the label. Belgian works, Trappist is another. 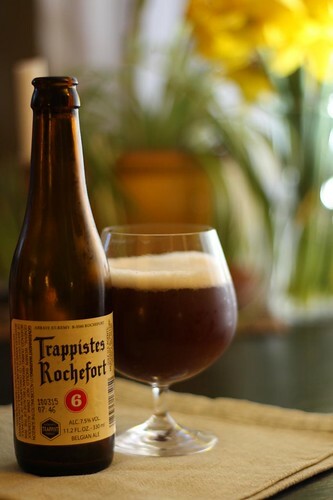 Since this beer mentioned Trappistes (a multiple of one of my keywords) I figured I couldn't go wrong. I looked at their official website and I couldn't really tell if it was for a monastery or maybe some sort of Belgian real estate company. Later I found an unofficial fan site where I learned that the particular one I'd chosen was an extremely hard to find and rare version that represents about 1% of their total production. More reading on their Wikipedia page and Facebook page confirmed that I'd picked a very rare beer indeed. I also picked up two other beers but the reason I chose this one was the fact that the others are well over 10% alcohol. My nickname of "One Beer Beaudry" may be in jeopardy if I drink anything higher than 8%. I'm the world's most adventurous drinker.